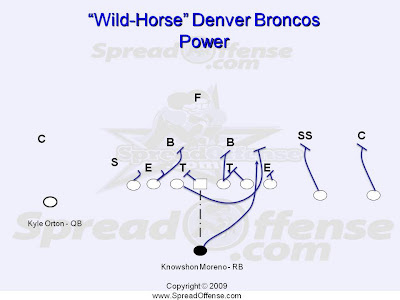 The 'Power' has been a popular play for years out of the "I" formation as well as one back formations with the quarterback taking the snap from under the center. Over the past two seasons, you are now seeing this effective run play become a staple out of the shot gun spread offense, like the zone read option. Whether out of a single-wing/'wildcat' set or out of a traditional shot-gun set with running back(s) flanking the quarterback, this play is allowing for some very creative play calling by coaches at all levels. 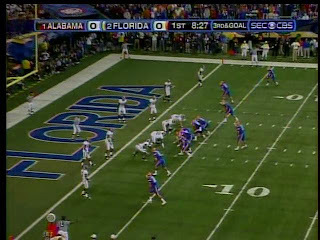 As you will see at the end of the video below, the Florida Gator 'inside shovel' pass is power blocking by the offensive line. This video is a great collection of 'Power' plays out of the spread offense. I just got done watching a little NFL football on this lazy Sunday afternoon in October and I thought to myself... "Man, this is kind of boring?" 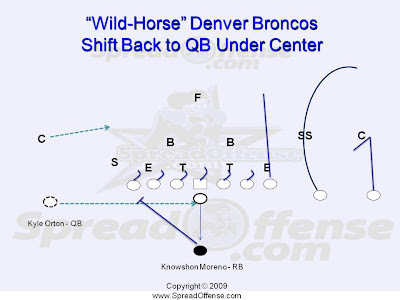 Series after series of pro-set I formations with the quarterback under center. A lot of ISO's and Power's out of the 'I' just doesn't cut it for me anymore. Then, I thought about yesterday (Saturday) and all those great spread offense college teams I was watching... Houston, Florida, Michigan, Texas, etc... had me turning the channel like a mad man, trying to catch all the action. Even on Friday nights, watching ESPNU and the national high school football games, with most of those teams in the shot-gun spread offense. I think that's the keyword... the 'action' that the spread brings to a football game. I'm sure there's no conclusive evidence out there, but I believe that spreading the formation with offensive players horizontally across the field and using a dual threat quarterback out of the shot gun does 'excite' the game. Of course we all like to see great plays on the field no matter what formation players are in, because at the end of the day it is a players game... that I agree with 100%. But I relate it to a fast break team in basketball, pressing the action and being aggressive on offense, this I feel the spread offense in football does cultivate. Now don't get me wrong, the NFL does have its exciting coaches and players like Josh McDaniels in Denver, the 'wildcat' in Miami, and of course Peyton Manning when he's running the no huddle spread offense of the Colts to perfection. I guess I'll just have to wait until Urban Meyer becomes a head coach in the NFL.